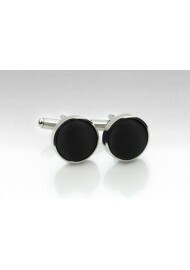 A formal cufflink set made from an elegant polished silver with unique satin fabric covering in black. To make sure to create the perfect matching cufflinks to one of our most formal ties, we used the exact same black fabric. For all other available styles for this cufflink set such as neckties, bow ties, and hankies, please see the links below.